Contrary to popular belief, creating a block model in the Maptek Vulcan software package is not overly difficult. Estimating grades for the block model can be as tedious and convoluted as you want it to be but creating the shell for that model to go in is an elementary exercise. 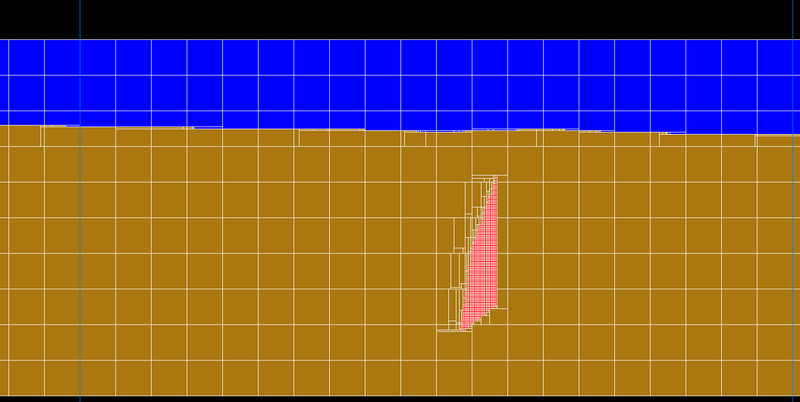 Block Model slice showing air (blue), country rock (brown) and ore (red). 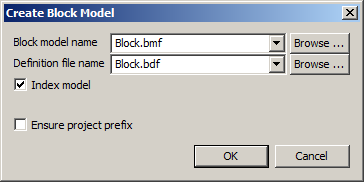 To start, create a new block definition file (*.bdf) by selecting Block > Construction > New Definition. By selecting this menu option you will enable the Block Model utility in Vulcan Workbench and open the Block Definition panel. Block Model Orientation - defines origin and rotation. The first decision we need to make in creating our block model is the origin and orientation of the model. The origin is the minimum x, y and z coordinate of the block model. 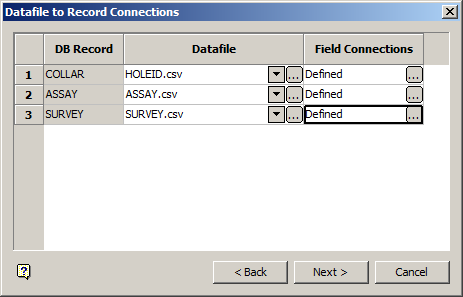 Fill in the fields ‘X Coordinate:’, ‘Y Coordinate:’ and ‘Z Coordinate:’ with the appropriate values. These should usually be something farther east and south than the deposit we are modeling and at a lower elevation. Don’t get too carried away, we don’t want to model the entire country, just enough to contain a mine design. Block Model Schemes - defines the parent and child block sizes. Scheme: The name of the block sizes to be defined. These are often called Parent and Child schemes. 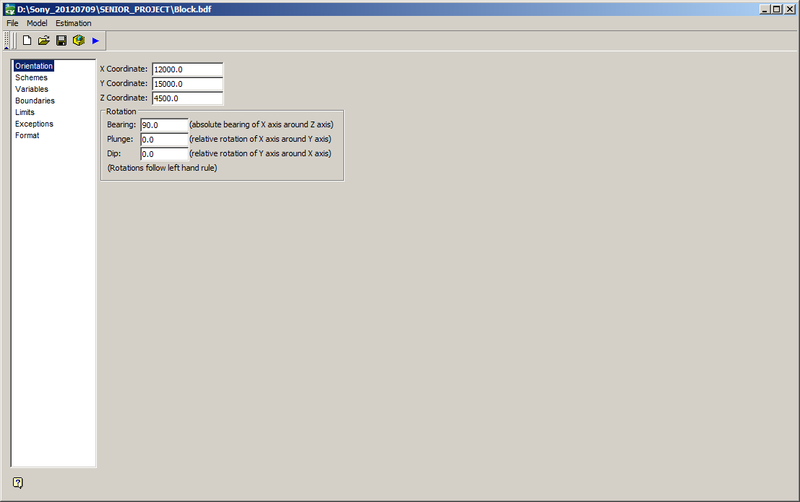 Start Offset: This is the offset from the origin where we want to start creating blocks. This is usually zero, although you could set the origin to zero and the offset to the origin coordinates if you really wanted to. End Offset: The maximum extent of the block model as measured from the origin point. Block Size: The size of the block model block in the X, Y and Z directions. Parent blocks are usually quite large with child blocks being significantly smaller. Parent blocks must be a multiple of child blocks. Blocking Maximum: Once a parent block has been broken down into the child blocks Vulcan will try to combine them back together again to create the largest block that honors the geologic boundary up to the blocking maximum. The blocking maximum may be as large as the parent block. Parent blocks do not need a blocking maximum definition. Block Model Variables - defines the variable name and type. 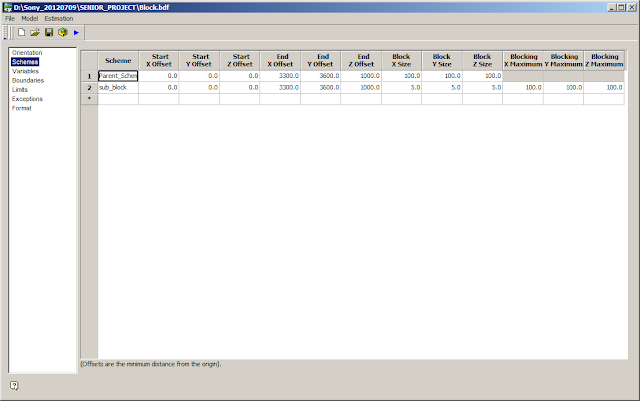 Variables define the space in which to store data for each block model block. If you forget to add a variable during creation of the block model, don’t worry. You can add variables later. I would advise everyone to add the variables to the block definition file at the same time they are adding them to the existing block model. Later, when you are re-creating your block model with updated drilling, you will thank me. Name: This is for string type data (i.e. geologic domains). 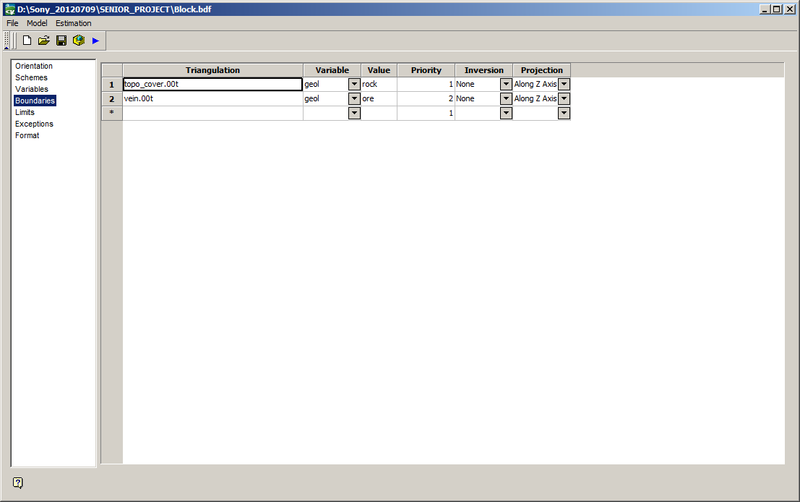 Your data is stored in the block model as integer data and then converted back to the name values using a translation table. Byte: This is an integer value between 0 and 255. The byte variable type takes up one byte of memory. Short: Integer value between -32,768 and +32,767 requiring two bytes of memory. Integer: Records integer values between positive and negative two billion. Uses four bytes of memory. Float: Real number using four bytes of memory. Can store up to seven significant figures. Double: real number using eight bytes of memory. Can store up to fourteen significant figures. Keep in mind that minimizing the amount of memory for each variable can significantly shrink the file size of a block model with millions of blocks. Unless you are storing incredibly accurate grade data or plan to store UTM coordinates to your variables, the Float type variable is probably good for any real numbers you need to store. Remember that you can break down by the Name, Byte, Short and Integer variable types when generating reserves later. Block Model Boundaries - triangulations defining geologic regions. Boundaries are the triangulations that define the geologic domains. Select your triangulations (surfaces or solids) and the variable they will which they will write information. Value is the variable result that will be written. Priority is the order that the variables will be written. If two triangulations overlap, priority 2 will overwrite priority 1. Inversion reverses the direction in which the triangulation is projected (i.e. solids will be flagged outside the shape, surfaces will be flagged from Z up instead of Z down) if ‘complete’ is selected. ‘None’ is the default option. If your surfaces completely cross the block model area you don’t need to worry about ‘partial.’ Projection is the direction in which the surfaces will be flagged, default is along the Z axis. Block Model Limits - defines the coalescing of child blocks. Limits sets a maximum size for child coalescing based on a variable value. This is interesting but I almost never use it. 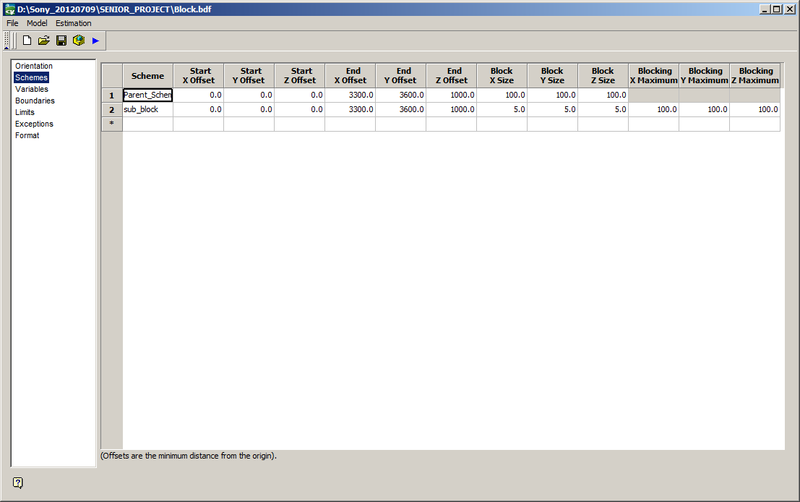 It might be useful inside an ore zone just so the grades can be defined on a tighter interval. I don’t know many people who use this option. 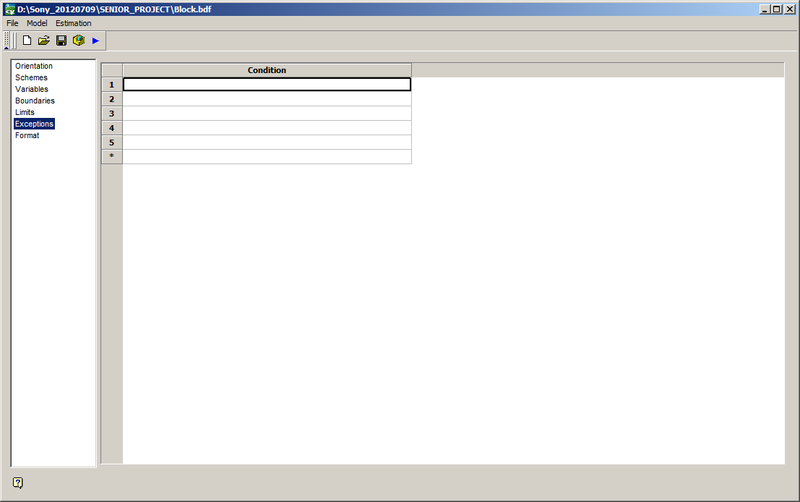 Block Model Exceptions - defines which blocks not to include in the block model file. Exceptions are blocks that should not be created in the block model. Back in the days when memory was limited, it was common to define regions of the block model (above topo, outside mineralization, etc…) that should not be saved to the block model file. As memory has become more cheaper and different formats have become available, the necessity of making exceptions has gone away. I would suggest that you not exclude any blocks. Block Model Format - classic or extended. Always extended, always. The original Vulcan block model format (Classic) stored all data for all blocks. This meant that if you had a million blocks with the default value, your block model file had written the default value one million times. 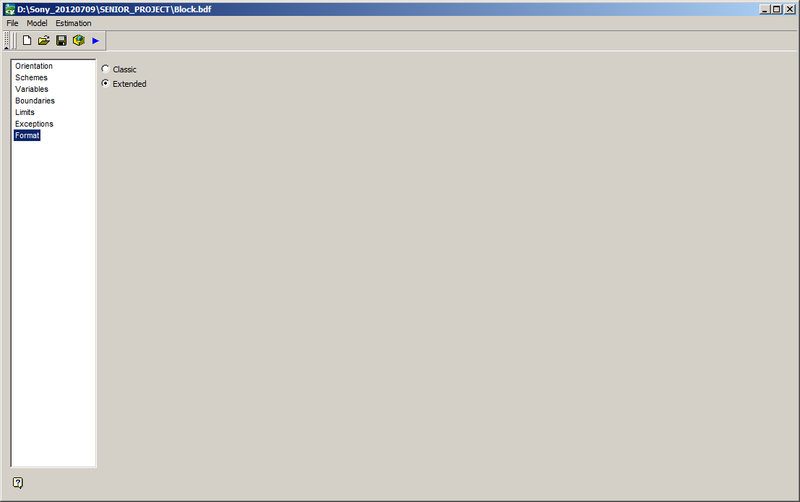 This resulted in a very large model file. The ‘Extended’ format writes all default information to the header and then references the header for any blocks with default values. This means than in the extended format, if you have a million blocks with the default value the block model file will write this value to the header once (not a million times). This method saves a significant amount of file space. Always use the ‘Extended’ format. 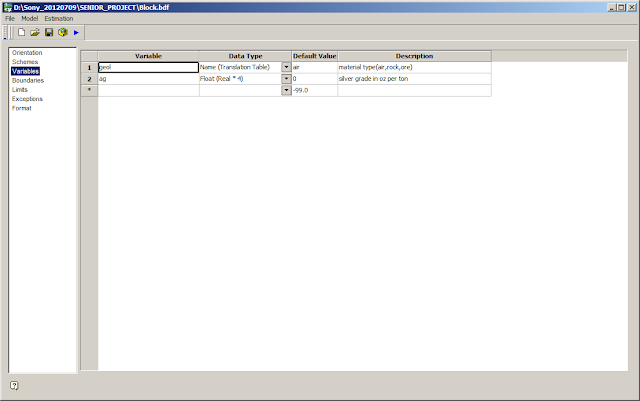 At this point your block definition file (BDF) is complete. Go ahead and save it by selecting the ‘save’ icon or the File > Save menu option. Return to Envisage by clicking File > Quit Block Model Utility. In the Vulcan Explorer expand the Block Models folder. Your new block model will appear below. Expand the block model to see the variables in the model. That’s it. You just created a Vulcan block model.